I’m thankful they weren’t wrong. Chris had just handed Jack over to me. It was the first time I had laid eyes on my new baby. After a few tears about how the delivery went, little did I know there would be more tears. I remember him saying, “They think he has Down syndrome.” More tears, the ones that you let stream down your cheeks because you can’t gather yourself. Burning tears, as I looked down at his almond eyes and cried out. The word ‘think’ was what I kept replaying in my head. I hoped they were wrong. I hoped that it was a dream and wished I could go back to the day before. I was a young, 32-year old mom, this wasn’t a part of my plan. As I sit here, almost 4 ½ years since that Monday night, I am thankful they weren’t wrong. I’m thankful my plans didn’t work out. I’m thankful I was not in control, as my heart and my mind have been changed. 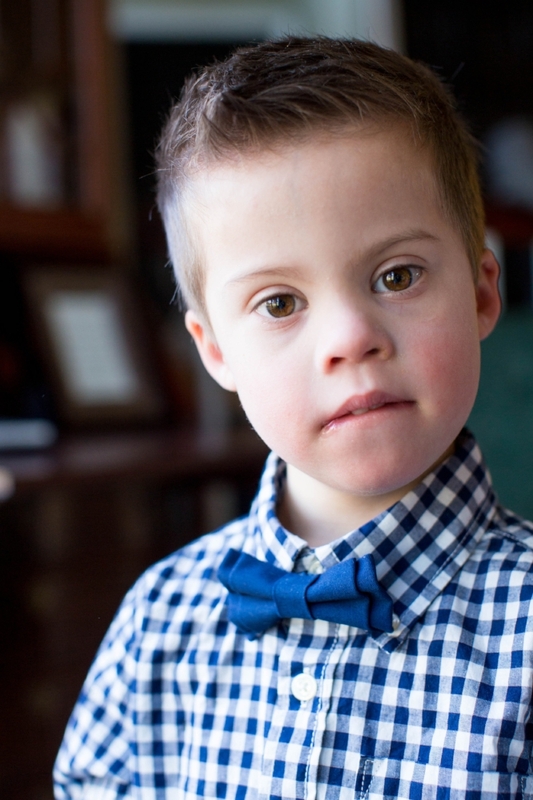 I’m thankful my son has Down syndrome. You see, I am a planner. I like to plan everything out and envision it all falling into place. When picturing my future family with my husband, I vocalized I would have all my babies before I turned 35, because who would ever ‘plan’ to increase their risk in having a child with a unique genetic condition? Don’t we plan our lives around what will be most comfortable, easy, and rewarding? Don’t we do our best to avoid things that are challenging and require hard work? Isn’t that what our society breeds and what our world is moving towards…choosing what (and who) has value based on the majority’s view of what ‘success’ looks like? I was ignorant. Choosing plans, opinions and judgements, generalizing groups of people based on my lack of experience with difference. I marginalized people, sometimes intentional and sometimes completely unintentional. I was wrong, please forgive me. And then I gave birth to a little boy, that changed my heart and view of others. He opened my eyes to a world of difference. And I’m thankful for that. He’s reminded me that each person deserves to be loved no matter a person’s genetic uniqueness, ability, race, or other difference. EVERYONE deserves to be loved, respected, and valued. He reminded me of what my heart knew but never truly understood (and sometimes didn’t carry out). Isn’t that how our lives should impact another? Shouldn’t we bring out the best in others? I’ve learned some of life’s best lessons when things are hard. When things are challenging. I’ve learned best when I’m on my knees, in a humble position, claiming I can’t do this alone, and I need help. I’ve learned most when those tears have turn into tears of joy, seeing God’s goodness in a path unexpected, yet so good. Reflecting on milestones and goals achieved, we celebrate the little things. We celebrate what and who truly is important in life. I’ve seen a community of people rally for each other, because they know the hills and valleys, the love and joy that comes on this journey. I’ve also realized that a diagnosis doesn’t determine the amount of love I will be able to give and receive from Jack, who deserves it, just like all of my kids do. And for that, I’m thankful they weren’t wrong. Another thing this little boy has taught me is that the only thing I can control is how I respond. How will I respond to these unexpected events that happen in life? Am I going to stay stuck and continue to grieve that my plans didn’t go as expected? Filled with a variety of emotions, tempted to take the role of being a victim of our circumstance and missing the joy and growth that comes when we surrender. Will I recognize that’s it’s not about us and allow ourselves to be used for a greater purpose? Will I see these events as an opportunity to be used to model choosing joy in the face of adversity, and the impact that makes on others? Knowing that I can bring hope to someone else’s circumstance. I’ve learned I’m not in control, and it’s been a journey of trusting and knowing He’s faithful and His plan is trustworthy and good. I am so thankful they weren’t wrong, as I wouldn’t be sitting here responding with a heart of thanksgiving for the ways I’ve been changed for the better…for plans that didn’t go as I had expected. Oh, how I’m thankful I was wrong. Thank you, Jack, for bringing out the best in me. *Our thankful video that was put together in 2014, when Jack was 18 months old. Some things never change with time, our love and our thankfulness.